This is the fox farm which we later called the poultry farm. for us to hike and explore. Also, just two blocks from home, we had a slow running river with lots of bushes along its banks. In the opposite direction, one block away from home, were the railway tracks and a variety of railway structures that we played on, in, and around. 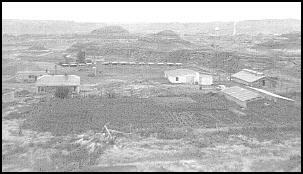 As well, a ball diamond and a gravelled school yard were within a block of our home. However, for some reason, we chose the convenience of our side street, right next to our house, to play catch, running yards, etc. When we were young, we lived in the hatchery (on the right), and six years later we moved into the house on the left. So while growing up we were close to the excitement and challenges that came with a new and expanding business. It wasn't long before Mom and Dad were adding a poultry farm and a branch office in Hanna, 50 miles (84 Km) away. 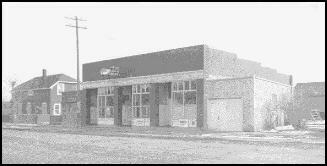 The atmosphere that was created by this successful business probably had a direct impact on the variety and intensity of our free play and recreational choices. This is a photo of all our cousins. The weekend when all our relatives assembled at our home was an exciting time. Our home was centrally located, so during this time many of our relatives would meet at our place or stop off as they passed by. 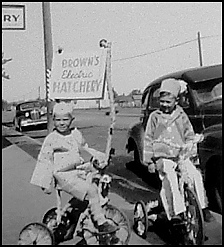 It was probably about 1950 when Mom decorated our bikes for the local parade in an effort to promote the hatchery. In 1951, when I was 7 years old Mom and Dad put a chicken in the parade. It looked impressive because it was put in the middle of a long line of trucks. are in the distance, and the stockyards are on the right. It was acceptable to fight with your fists or by wrestling. � However, if someone tried pulling hair or scratching with their finger nails, they would be ostracized for "fighting dirty. "� Almost no one fought dirty, and in spite of Drumheller being a tough mining town, I can't recall hearing of anyone trying to fight with a knife.� All the kids would find a knife totally unacceptable. So, important decisions were made on the ball field and at the stock yards. Maybe that is why, a number of years ago they chose this location to build a court house, a place to make more important decisions. Bob has worked at various jobs in retail, spent a number of years doing service work with a gas company, and then finished by working for the city of Drumheller. He died in 1997 when he was shocked when installing swimming pool light bulbs and then fell from his ladder into the pool. My February 25, 1955 diary entry states that when Wayne and Tom were in the basement of the hatchery making chicken boxes, Bob and myself attempted to sneak up on them from the dark side of the room. Even though I only made one "Tom" entry in my diary, I cannot resist doing some name dropping by telling the reader what became of him. Tom was one of the kids we had a fight with around 1953 using clumps of grass which we pulled out of the ground. The dirt stayed attached to the grass, so they were neat to throw; and they gave us good reason to dig trenches for protection. We had an interesting battle. No doubt this helped Tom in later life. He became an Engineer and moved to Vancouver. Soon he was an MP and then a Cabinet Minister. He was Minister of Native Affairs during the 1990 Oka crisis (when the natives came face to face with the army), then Minister of External Affairs, and then later under Prime Minister Kim Campbell, he briefly became the Minister of Defense. The Bartons (featured in mud hike in 1955 link): Bill, Bob, and Earl went on to become an architect, a University computer worker, and a High School teacher respectively. Bruce went on to become an RCMP constable, an irrigation water technician, and then a truck driver. More recently, before the recent real estate boom, he bought into a rural property with an excellent location. In his spare time, he fixed it up and imported a house from a remote town, and in so doing, converted his property into an acerage. Events in my personal life in 2001 have forced me to post this more detailed and specific description of my unique career. Unfortunately, I can't post all the details. So while some people will pass negative judgment because I haven't explained enough, others will complain that I've explained too much. Even though I am a semi-retired senior, there is still a need to explain why my career was difficult and frustrating, with no apparent direction. While this website (and other projects I did) suggests that I should have done really well with my career, unfortunately, that's not what happened. Many of my career struggles can be mostly explained by the effects of Post Traumatic Stress Disorder. Over the years, the restrictions on my ability have ebbed and flowed depending on what I was working at. I did adapt, but the restrictions were always there and always too strong. Although I am an introvert, tension was still the worst on introvert jobs. They required that I remember and focus, and since that was difficult for me, every minute of the work day was spent being extremely tense, with my stomach tied in knots. I couldn't quit because I doubted if I could land a new job, and if I did land one, there would be the usual struggle to learn it, and then the same struggle to keep it. This situation eventually led to a variety of chronic health problems. Later, I was able to get into sales, where there was less job pressure. But I couldn't progress: as an introvert, I couldn't develop the skills needed. A number of jobs led to burn-out. Jobs that put me on my feet were painful, and near the end of my career, I found out that it was due to low bone density. Being tired due to a lack of quality sleep was a major long term road block. Unlike most people who can function when tired, my mind tended to become erratic and to shut down. It isn't surprising that I eventually clung to routine work (work that required minimal learning, and afternoon starts), because that's all I could handle. Immediately after High School when I was unable to find a job, I chose to return to school with the hope that it would lead to a decent career, or at least increase my ability to land a job. After failing the first year of University twice due to struggles with learning and pressure, I worked in the bank for 5 1/2 years. But remembering struggles and the constant pressure eventually impacted my ability to handle the job. Next, I landed an introverted accounting clerk job. But there was excessive tension because it was necessary to constantly try to focus and remember, and my health soon became a major concern. Volunteer work inspired me, so about four years later I landed extroverted work as a retail salesman. There was less pressure but I didn't have the abilities needed to progress, another frustrating dead end. For short periods I also held five other low paying jobs of various types that I was not suited to and which did not hold a future. During these years, all the various tests, workshops, and career counsellors that I made use of failed to provide solutions. The weaknesses nullified my strengths, so test results showed no workable solutions. After another period of frustrating unemployment, in 1980 I returned to school in hopes of becoming an elementary school teacher. Taking another expensive gamble seemed to be the best alternative (since nothing else seemed workable). I had had some success with training and with being a volunteer leader, so my hope was that the University courses and training would help minimize my weaknesses. It was a relief to find that this time I was able to tackle some courses with confidence and do really well. However, when it was crunch time my mind responded poorly to the high volume of work. So the pressure increased, and my ability to perform as a teacher got even worse. (Most students responded to the heavy work load while student teaching by pushing through in spite of being tired and so become better teachers. But when I was tired, regardless of how hard I tried, my mind made blunders and gradually shut down.) Both plan A and plan B didn't work out, so I wound up with a Bachelor of Arts degree. It was time for a new strategy. So in an effort to improve and broaden my skills, talent, and interests; to improve my job prospects and to make a little money, I turned to recreation, writing, and a part time job. Hard work on the part time job eventually resulted in a promotion. But I again struggling to learn under pressure, and then did poorly under little pressure. The emotional struggles of past jobs caused complications, so I eventually wound up back on my previous job. Later, a number of times I had the chance to move into a minor supervisory position, but when I was tested, I again did poorly and struggled with numerous things. At that point, I simply couldn't handle it. The last years of my career were spent clinging to a routine job while trying to make money elsewhere. I kept working long and hard at desktop publishing, photography, online trading, web site building, marketing work, organization analysis, and then videos. Many think I had tons of other jobs I could have tried, but I wasn't going to be hired and trained when they knew I would be better off making use of my degree. But in order to land a good job related to my studies, I needed a Masters degree. So I tried to make use of my talent and abilities working with small businesses and their organization. Although I made a lot of progress, and made a lot of contacts, it didn't work out. Problem: - Most website builders have a lot of training, so expect a lot of money; but most small businesses don't have much money. So the solution I found was to start by doing an entire district for free. You can probably do 5 to 10 businesses a day, taking about 4 photographs and then helping the owner write up some information, to present the businesses greatest assets. Most owners don't have time for the Internet and will need help, so tell them it is almost the same as creating a business pamphlet. Since you go from store to store, collecting the information all in order, it is easy to assemble it into a cookie cutter website. They can all be linked to an index, plus link to a map or cluster them together by block. In this way, a customer could enjoy window shopping through each store from their own home, getting to know the owners and the business. This would increase their attachment to the stores, improve their impression, and increase their interest in buying things there. In order to make money, you will go from sevicing all the stores to spending more time servicing those who need weekly updates, or who prefer a more elaborate website. Since you have become established in the district, have proven yourself to be reliable and available, you are in an excellent position to draw in more business. I did put a lot of work and effort into this, my Plan D in both Calgary and Edmonton, but eventually realized my skills and abilities were too limited. to build at the end of my diary. to other photos related to diary. Posted January 10, 2001 .